Ever since I started working for the Nature Conservancy of Canada (NCC), where I was exposed to the world of conservation science and communications, I grew fond of birds and wanted to share this newfound interest with my family. My dad was an early adopter of bird watching, and perhaps out of love for his adult daughter, he shopped around with me for bird feeding systems and eventually installed one in his backyard. At first we attracted only house sparrows and squirrels, but after dad installed a DIY squirrel guard (a collar) and piled our feeders with more species-specific seeds and nuts, blue jays, cardinals, chickadees, woodpeckers, juncos and nuthatches started making appearances and hanging around our yard. Watching the power struggle and natural pecking order provided hours of intrigue and entertainment. I wondered if we could do more for the birds in this small patch of suburban green space; we give them food, maybe we could give them shelter too. Earlier on Family Day in February, dad and I spent an afternoon building chickadee nest boxes from scratch. I picked the simplest design for this trial ― a close-ended plastic tube that can either hang from a tree branch or be mounted to a pole. Watch my instructional video at the end of this post if you’d like to build your own! Follow these instructions to build your own nest box. Can’t birds find homes for themselves? Not all birds nest in cavities, so nest boxes are meant to provide shelter for cavity-dwelling birds (there are approximately 50 species in Canada). 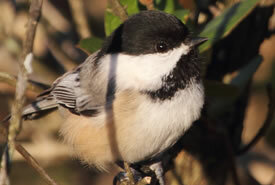 Common backyard birds that may use nest boxes include black-capped chickadee, tree swallow, house wren and red-breasted nuthatch. With habitat fragmentation and urban development, there are fewer intact forests, woodlands and other natural habitats than there once were. 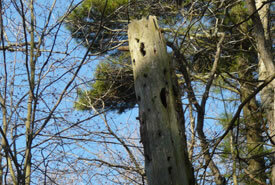 There is also more competition for trees with suitable nest holes between bird species and with mammals, such as squirrels and bats. Dying trees or snags are routinely removed for aesthetic purposes or because people are unaware of the habitat they provide. By setting up a nest box, you can help provide more nesting sites and in turn potentially help bolster a declining bird population. Like humans who consider geography, neighbourhood and proximity to work when looking for a place to live, different bird species have preferences for their nesting habitats as well. So while you may really want to attract that flashy bluebird to your yard, or welcome a variety of species, you will need to determine what birds your yard and the surrounding plants support. Nestwatch provides a good summary of habitat requirements, including optimal height to place the box, entrance hole size and spacing between boxes. 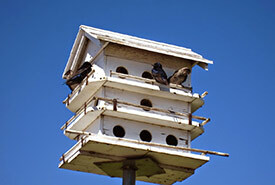 Some bird species, such as purple martin, nest in clusters, so you may want to consider building a bird condo with multiple living suites instead of a bachelor suite. Having the right entrance hole size for your species minimizes the chances of attracting unwanted guests, such as introduced house sparrows and European starlings. In general, the smallest hole a house sparrow can fit through is 3.2 centimetres wide. Avoid predators such as squirrels or snakes by placing the box away from shrubs or fences and consider installing predator guards for more protection. A perch by the entrance is also not necessary, as having one may grant access to predators. Position the entrance away from the impacts of weather and wind if possible. Some designs include a sloped roof to keep out rain, while all boxes should have ventilation and drainage holes. Clean nest boxes before and after nesting season, as parasites are common in nature and can affect breeding success. Read more on what to do if your nest box becomes infested while being occupied. But above all, aside from providing supplemental nesting sites near human residences, it is important to remember that birds need intact and undisturbed natural habitats. NCC works to conserve ecologically significant areas that provide habitat to many species of birds and wildlife, coast to coast. 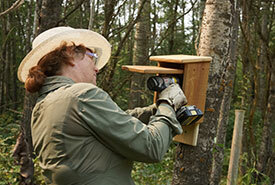 Throughout the year, its Conservation Volunteers program seeks the public’s help to steward the conserved properties, including the building of nest boxes for birds and bats. Thomas Lovejoy, renowned biologist and the “Godfather of Biodiversity” once said, “If you take care of birds, you take care of most of the environmental problems in the world.” We can all be a part of the solution by taking a small step toward that goal right in our own backyard. In our next blog, learn how to build a bird feeder with simple ingredients that can be found at home. 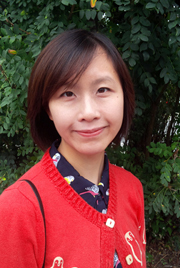 Wendy Ho is Nature Conservancy of Canada's editorial coordinator. Read more about Wendy Ho.